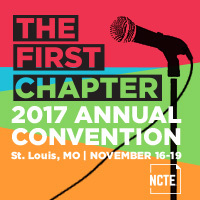 Are you considering submitting a proposal for the 2017 NCTE Annual Convention? You should! We’ve been getting some questions about the process and thought it would be a good idea to address the most frequently asked ones below. Is the proposal system live? Yes! The proposal system went live on November 19 and can be accessed here. Full details on the word counts and fields you will have to fill in can be found here. Why is the deadline January 5 January 12? Your proposal goes through many review steps before a final determination is made about selection. In order to ensure that each proposal gets the time and attention it deserves, we selected a deadline that offers the maximum amount of time for review before our program selection meeting in February. Additionally, the timeline this year reflects a new plan to ensure announcements about the 2017 program go out in April and include schedule information so presenters can secure funding and make arrangements to attend earlier in the year. To accommodate these improvements to the overall process, we opened the proposal system four weeks earlier this year in an effort to provide you with as much time as possible for completion. NOTE: The deadline has just been extended by one week in response to feedback from our members. We have worked to adjust the review process so we can still address the needs outlined above within this new time frame. Can I get help with my proposal? Yes! NCTE has online coaches whom you may contact to help you hone your proposal before you submit it. To give coaches time to work with proposers, please request assistance as soon as possible. Please indicate your reviewer level when emailing annual2017@ncte.org to request a coach. What topics are being considered this year? What’s the criteria for selecting sessions? Be clear and thoughtful. The more specific you are, the easier it will be for reviewers to imagine what this session might be like. Think engagement. In her call, Jocelyn Chadwick explains that “all program proposals must be interactive, engaging the audience and providing clear takeaways.” Sessions that involve participants in activities, discussion, Q&A, or other kinds of interaction are often the most popular at the Convention, and program planning decisions around proposals are driven by that knowledge. Make it relevant. There is so much going on in education right now that it’s likely any of your ideas will fit in, but bear in mind that attendees come from all over the country, from classrooms of every shape and size. Think about how what you’re thinking and doing in your local context could resonate with folks from lots of different contexts. The NCTE offices will be closed December 23–January 2. We’ll make sure to answer any additional questions as soon as we get back.